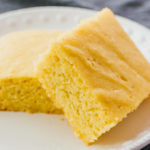 An easy keto cornbread made with almond flour, eggs, and butter. Its texture is fluffy and moist, and tastes only slightly sweet. Great for low carb and gluten free diets. Preheat the oven to 350 F. Prepare an 8x8 inch baking dish. Grease its sides, and line the bottom with parchment paper. In a mixing bowl, add almond flour, sweetener, and baking powder. Whisk until smooth. In a separate mixing bowl, add eggs, melted butter, and vanilla extract. Use an electric hand mixer or stand mixer to beat until well-mixed, about 30 seconds on low speed. Add the flour mixture to the egg mixture. Beat until incorporated and smooth, about 30 seconds on low speed. The batter should be thick. Pour the batter into the pan. Use a spatula to spread the batter to the edges and corners, and smooth the surface. Bake until an inserted toothpick comes out clean, about 25 minutes. Let the cornbread cool in the pan for 5 minutes, and then slide a knife around the edges to release it. Cut into 9 squares and serve while warm, optionally with sugar-free syrup or slices of butter. This recipe yields 1.5 g net carbs per serving (one 2.7-inch square or 1/9th of the recipe).